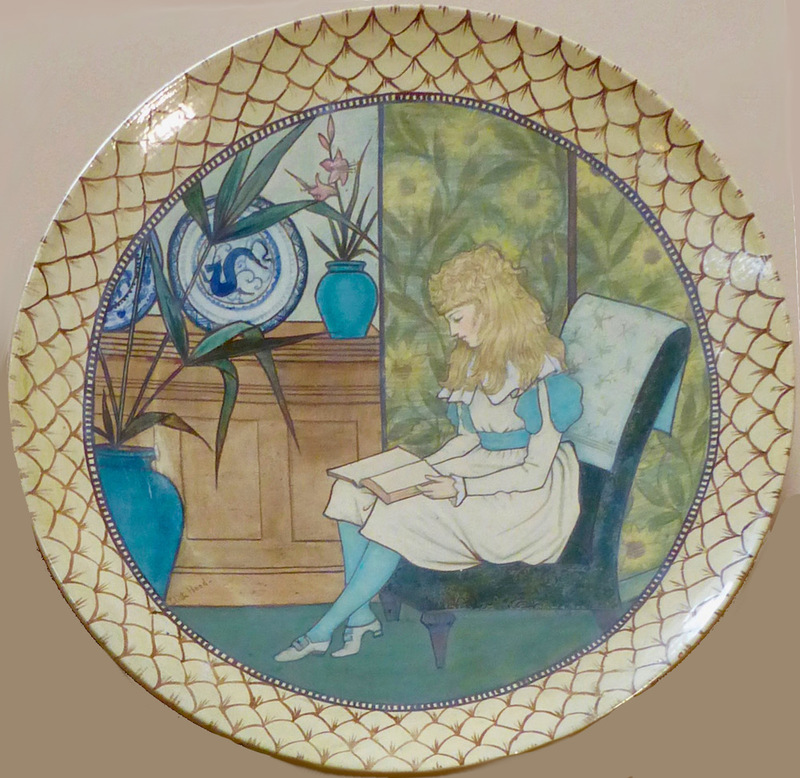 Pottery circular plaque, showing a girl reading a book. Designed by Edith Hoad, and on display at the Sandringham Museum, Norfolk. The girl is shown against a background of sunflower wallpaper, and a sideboard on which stand two blue-and-white oriental plates and a blue vase with delicate pink flowers. Another, larger vase stands on the floor in front of her, with leaves like those of bamboos. The Japanese ambience suggests that it is turn-of-the-century. Edith Hoad was probably the Edith Anne Hoad in the UK census of 1881, listed as the daughter of William Hoad of the village of Capel, Surrey, whose occupation was tile maker. At the time, Edith Hoad was listed as being sixteen. Her birth year is given as 1864 (last quarter) in the Births, Marriages and Deaths index. It is a shame not to know more about her.